The Offseason is officially over and Preseason for 2014 has begun. All Senior and Junior players are to report to the first official training session held at Monash University Clayton this Sunday 2nd February. All players are urged to get to training by 9:45AM to sign up, have their picture taken and be allocated a player number which will help coaches to track each player throughout the preseason. Training officially begins from 10AM and will finish approximately 1PM. Training will consist of some light training where players will get a basic understanding of their position, get to know their positional coaches and team coaches. Weather is forecasted to be 43°C so everyone is to bring water, sunscreen and a hat, no exceptions. Prepare for 2014 with pride! The Warriors Superbowl party on Monday 3rd February will be held by their proud sponsor ELEPHANT & WHEELBARROW in St Kilda from 10AM. Get down and enjoy the food and the game. There will also be giveaways, raffles and plenty of big screens to watch the game on. There will be reserved seating for Warriors players and familiy & friends. Get down and support the E&W St Kilda! The current Division II Champion Barbarians are moving into the top Division in 2014. There has been several changes to the structure of GV which last night voted that the Melbourne Uni Royals, Northern Raiders and Barbarians will join the Bendigo Dragons and South East Predators in moving into the top Division. With 10 teams now in Division 1, it is sure to be an exciting upcoming season. The Warriors also welcome the Pakenham Silverbacks and Melbourne Uni Lions to Division II who will join the Gippsland Gladiators and Ballarat Falcons. 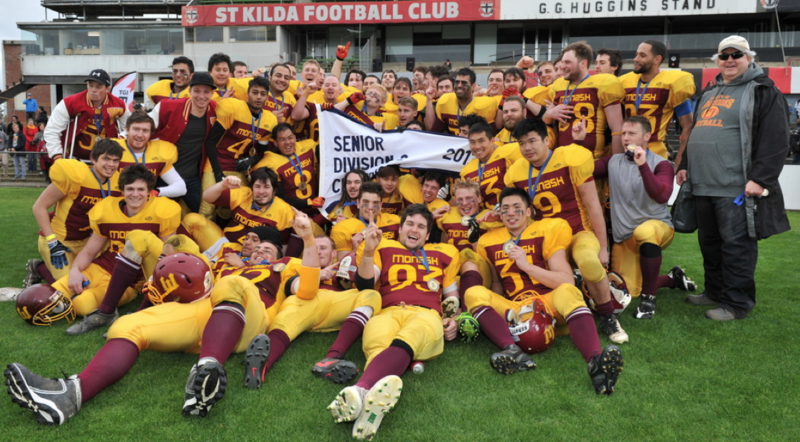 The Melbourne Uni Royals have now joined the Warriors in being the only current clubs with 2 teams entered into Gridiron Victoria. All Warriors and Barbarians players are to report to Pre Season training which kicks off on Sunday 3/2/14 from 10AM at Monash Clayton. Former Warrior Bailey Kenter has been voted in as one of Utah’s best 24 Prep players, voted by the Salt Lake Tribune. 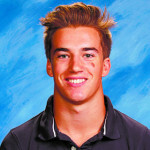 Along with being voted as one of best 24 players, Bailey was also named in the second Class 2A team as a Wide Receiver/Punter. Bailey has worked extremely hard since going over to the USA to persue his dreams of one day playing NFL, and whilst he has felt homesick at times, Bailey has earned awards for his play due to his hard work and dedication put in off the field. Bailey will look to improve on his Junior Season and come back bigger and stroger for the 2014 season. The Monash Uni Warriors and Barbarians are in their final month of holidays before they begin their preseason at Monash Uni Clayton. Preseason will be open to all new players and all returning players. For anyone wishing to play, coach or even just be involved with the club, they are more than welcome to come down and speak to the club members available on the day. Gridiron is a sport which accomodates all different body shapes and sizes. If you love the sport, there is no reason to miss out on being a part of it. Come down and give it a go. Required: Dark T-shirt & White T-shirt, Water Bottle, Runners (No cleats/boots).